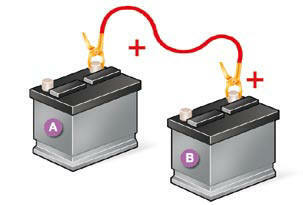 Procedure for charging your battery when it is fl at or for starting the engine using another battery. 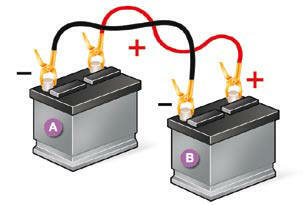 unclip the fuse box to remove the battery, if necessary. Connect one end of the green or black cable to the negative terminal (-) of the slave battery B .
Connect the other end of the green or black cable to the negative terminal (-) of the fl at battery A . Operate the starter of the broken down vehicle and let the engine run. Do not disconnect the terminals while the engine is running. Do not charge the batteries without disconnecting the terminals fi rst. - the remote control key, - the GPS satellite navigation system. 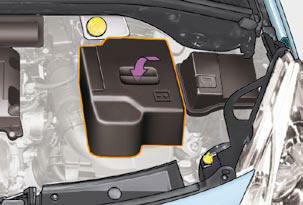 System which manages the use of certain functions according to the level of charge remaining in the battery. The deactivated functions are reactivated automatically as soon as conditions permit.